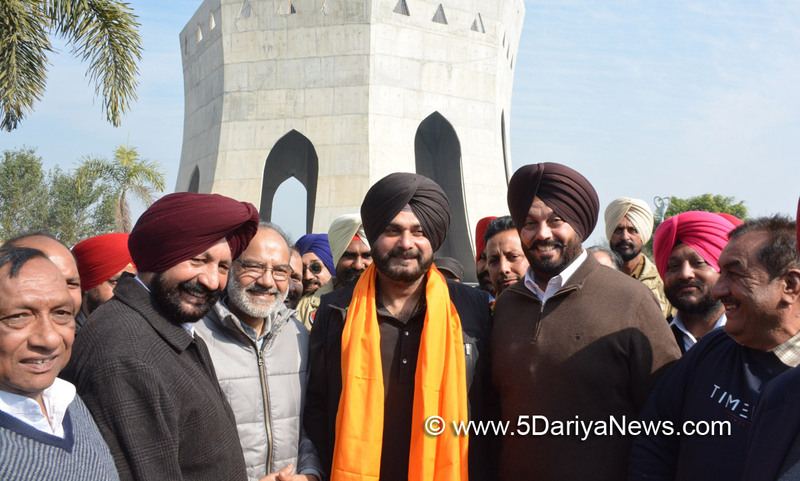 The Cultural Affairs and Tourism Minister, Punjab, Navjot Singh Sidhu today paid a visit to the Baba Banda Singh Bahadur Memorial at Chapparchiri and announced Rs. 24 lakh for the development of the place as well as the facilitation of tourists. The minister himself took stock of the conditions around the memorial after the MLA from Mohali Balbir Singh Sidhu demanded sprucing up of the basic infrastructure and brought to his notice the dilapidated condition of the approach road towards the memorial.Interacting with the mediapersons on the occasion, Mr. Sidhu announced Rs. 12 lakh on the behalf of the Rural Development and Panchayat Minister Mr. Tript Rajinder Singh Bajwa for the restoration of the approach road towards the memorial as well as Rs. 12 lakh from his own discretionary quota for the beautification and facilitation of the tourists. He further said that the Punjab Government led by the Chief Minister, Captain Amarinder Singh would develop historical and heritage sites of the State as tourist hubs to attract tourists from both country and abroad. Divulging more, he said that as per the directions of the Chief Minister the heritage festivals have been revived in the state and the department would hold heritage festivals at Patiala, Amritsar, Bathinda and Kapurthala with the first one in February at Patiala. The minister also disclosed that as per the slogan 'Sabhyachar Ton Rozgar' of the Cultural Affairs and Tourism Department the main motive is to create ample employment opportunities through the rich and glorious cultural heritage of the state. Mr. Sidhu further elaborated that chapparchiri memorial stands testimony to the glorious history of the Sikhs where Baba Banda Singh Bahadur established the rule based on equality and just principles by eradicating cruelity and lawlessness. He said that facilities would be provided at such historical spots to make them attractable to the tourists. He advocated creating congenial atmosphere so as to help the NRIs make their children aware about the extremely rich historical and cultural roots of Punjab. He also said that earlier Mr. Tript Rajinder Singh Bajwa was also scheduled to come with him but due to important meeting he couldn't make it. But Mr. Bajwa had authorized him to make any announcement regarding repair and renovation of the approach roads towards this memorial and that is why he has announced Rs. 12 lakh on behalf of Mr. Bajwa. The Cultural Affairs and Tourism Minister assured local MLA Mr. Balbir Singh Sidhu to put forward any demand with regard to the chapparchiri memorial and development of the city that would be conceded.Mr. Sidhu earlier along with Mr. Balbir Singh Sidhu visited the memorial and afterwards the approach road connecting Mohali with it and expressed deep concern at the shabby condition of the road. As a consequence, the minister announced the financial assistance.On the occasion, Additional Deputy Commissioner (Development) Mr. Sanjeev Kumar Garg, SDM Mohali Dr. R.P. Singh, Senior Deputy Mayor Mr. Rishabh Jain, Mr. Harkesh Chand Sharma Machhli Kalan Political Advisor of MLA Mr. Balbir Singh Sidhu and Congress leader Mr. Gurcharan Singh Bhamra were also present.